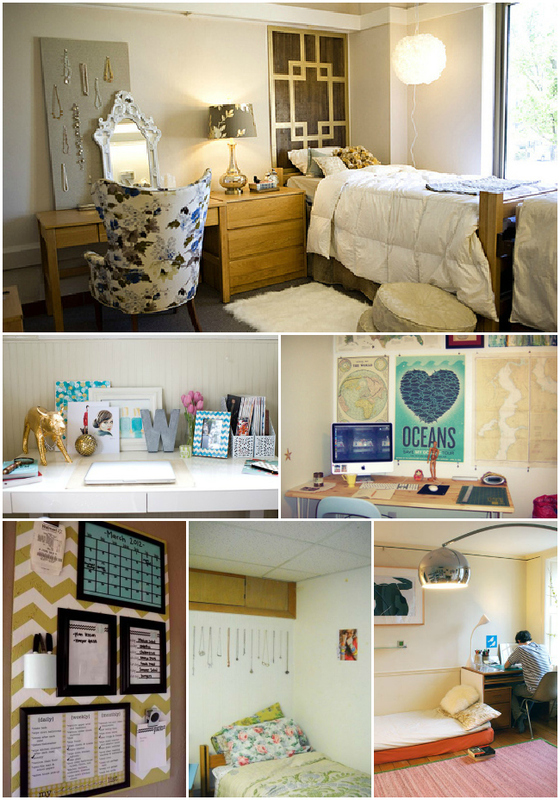 Nobody wants a drab dorm room come fall. If you're on this website, you've probably already been looking for dorm decor inspiration for a while. Moving into a tiny space doesn't have to mean you should give up all of your room design hopes, so below, I've collected some fun ideas for your new space! Enjoy! Also, be sure to leave any other tips or ideas you may have in the comments below! 1. Simplicity does not have to mean a boring space! Don't go overboard while shopping for dorm supplies, this will only crowd your already tiny room. Bring in just a few key pieces to make your space yours. In this photo, the student has hung a print instead of the typical college posters, has traded in the standard dorm room chair for a more interesting (and most definitely more comfortable) chair, and has brought in great accents such as a floral lamp and a white rug. Clean, simple, and not your average dorm room. 2. Find interesting pieces to put on your desk. Mix in organization, artwork, and a DIY letter or two and you've got a glamorous workspace! 3. Maps are a great way to dress up the walls in your dorm. Bigger maps make for a great statement piece in your space. 4. Make organization fun (and adorable). This DIY-er made a one-stop spot for their monthly calendar, food plans, to-do lists, and chore lists for the entire apartment! 5. Display your jewellery. Now, of course this depends on if you trust your roommates to lock the doors of your dorm (and not to steal said jewellery), but this simple touch, done with tacks on a cork board, definitely dresses up your room! 6. Lighting is everything. If you don't like the lights in your room, bring an extra lamp. If you want to dress up your room, bring a statement lamp! Great lighting will make you enjoy being in your room a lot more. - come up with a mood board on Pinterest or on your own. This will help you keep a solid vision of your future space as you are shopping for pieces. - stick to a general colour scheme or theme (you could even coordinate this with your roommate if you are sharing a room). - make sure you figure out how you will store and organize everything for the entire year. A more organized living and workspace means a cleaner and nicer looking space.